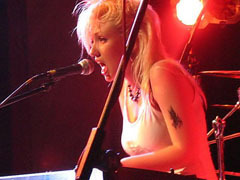 Godsend are the band that began as "Fizz" Reynolds, the singer/songwriter who won 2007's Live and Unsigned under 17's final. With the addition of Toby and Matt, who Fizz described as a "Godsend" she came to record her E.P. We ate A LOT of Pizza while they were here. Not that it's relevant, but we did.